This photograph was taken in 1925 not long after the building was open to the public. The Equity Chambers Building is located on the north side of Chatham Street West in downtown Windsor. 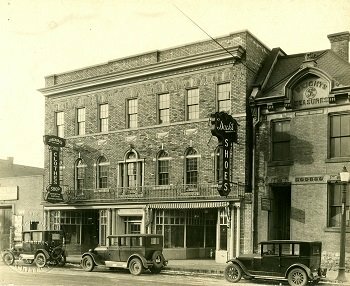 Designed as a commercial and office building and opened in September 1924, it housed Dack’s Shoes, J. Becker Company Ltd. Style Clothes Shop, Fleming, Drake and Foster Law Offices and Sheppard and Masson Architects. The Weights and Measures Building next to the Equity Chambers building housed the Dominion Immigration Office and was demolished in the early 1930s to make way for the new Dominion Building being constructed next door. The Equity Chambers building still stand at 52 Chatham Street West as an beautiful example of early Twentieth Century architecture. If you are interested in this image or other historic images of Windsor please visit the library’s digital exhibit “Windsor’s, History and Pictures“.